Exactly one year ago, David and I moved into our humble little abode. Even though we owned our previous house, it wasn't exactly home to us. To be quite honest, we weren't in love with it. 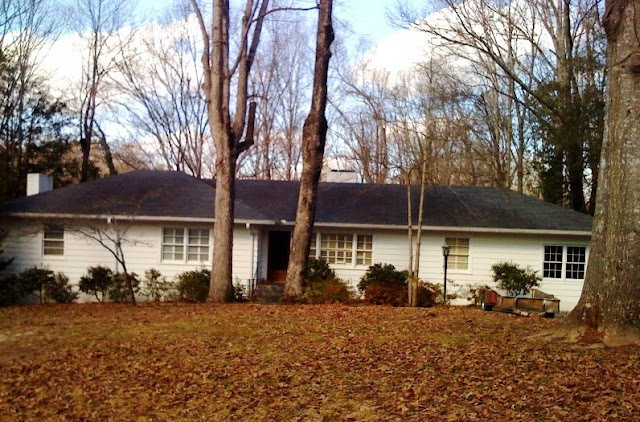 But, the minute we found our current 1952 ranch in our house hunting process, we knew it was "the one." And we've been blissfully happy and in love with it ever since! Here's the fall version of our front yard. 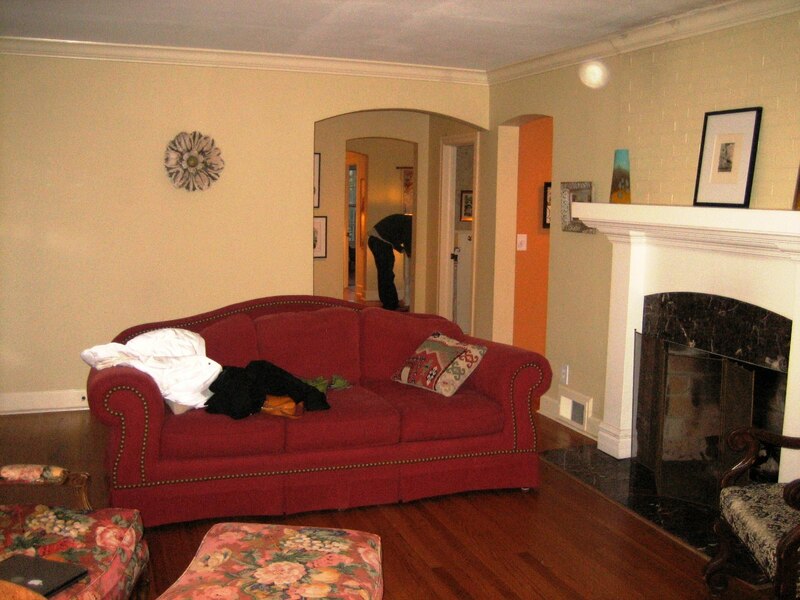 AFTER- We repainted the walls slightly darker and brought in our neutral, light and airy style! Here is how we picked out our paint style. 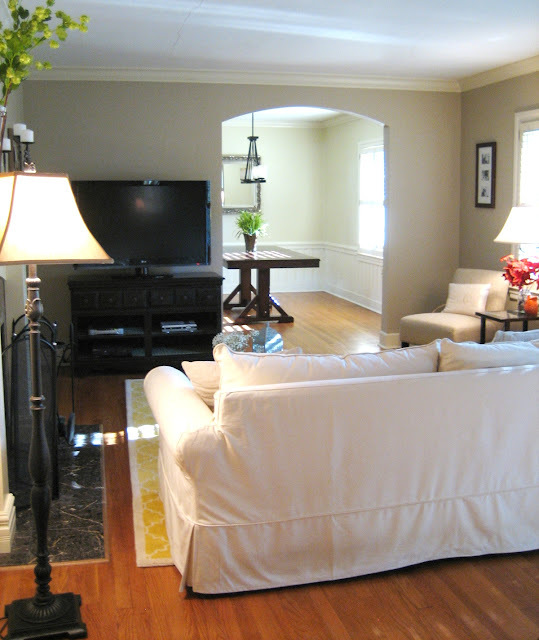 AFTER- Here is how we furnished and decorated our living room. 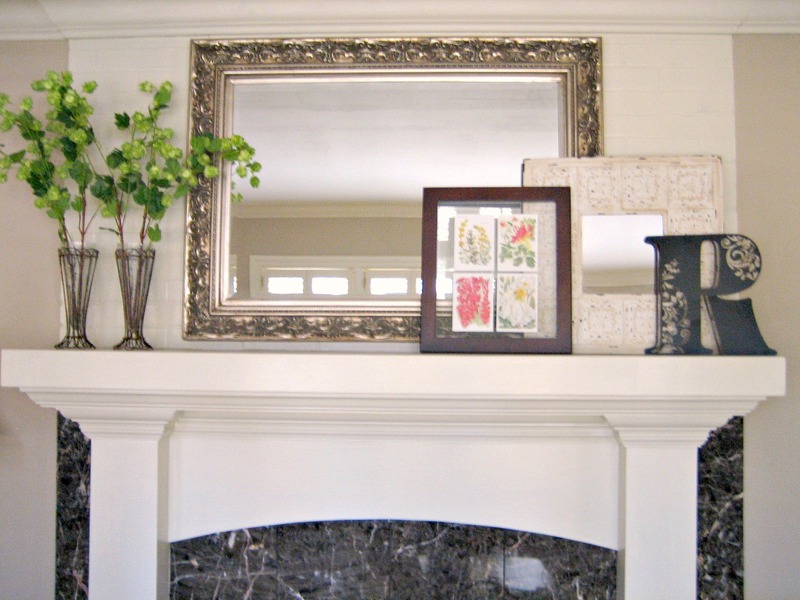 A recent update I made to the mantle. 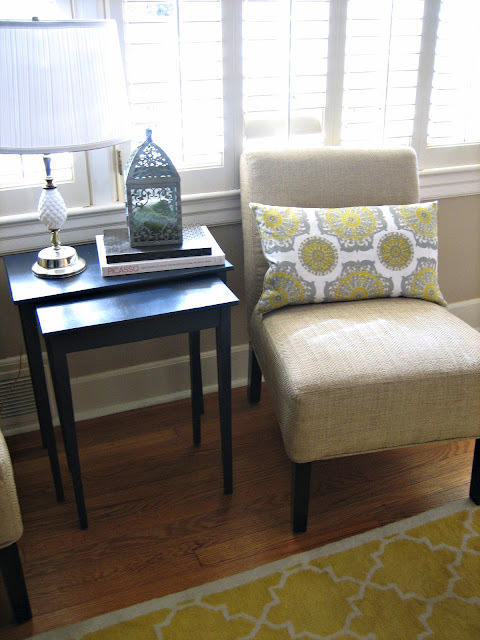 And a recent update to the sitting area- newly painted nesting tables and the addition of my Nana's lamp! BEFORE- Is it just me, or was this slightly medieval? DURING- The first steps we took in this room was to change out the lighting and purchased a dining room table- check out the details of that here. 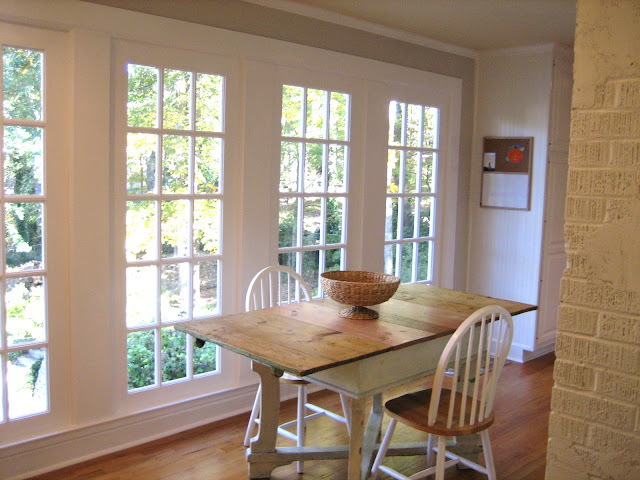 AFTER- Now, we've painted the dining room chair rail and trim a bright, crisp white (still need to paint the plantation blinds white!) and the walls a deep navy for some fun contrast. I also started a collection of vintage chairs to paint white and add around the table. 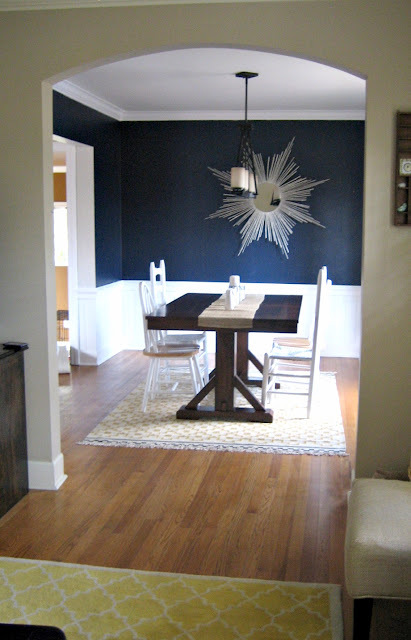 I DIYed this silver sunburst mirror for some added contrast to the navy walls. 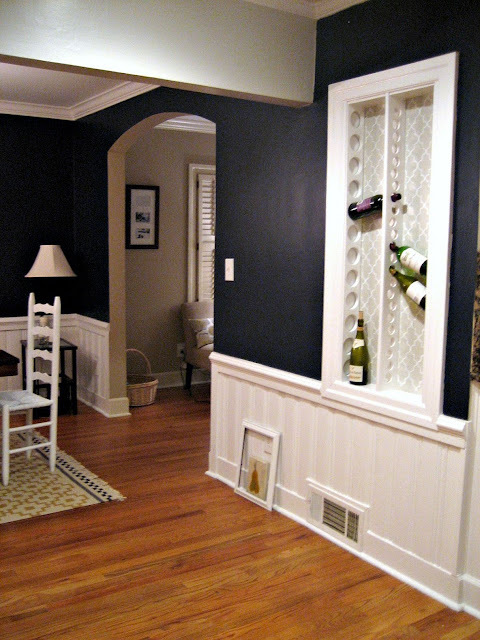 And we spruced up the built-in wine rack on the wall between the dining room and the kitchen. 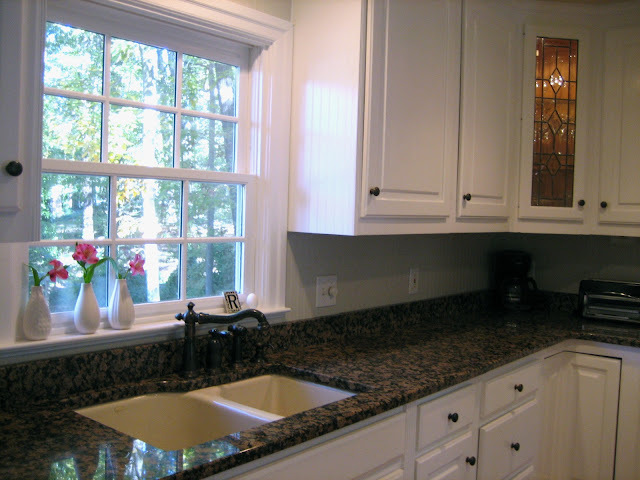 AFTER- Luckily, we didn't have to do much with the kitchen, as the previous owners had already remodeled with custom cabinets, granite countertops, and stainless steel appliances. 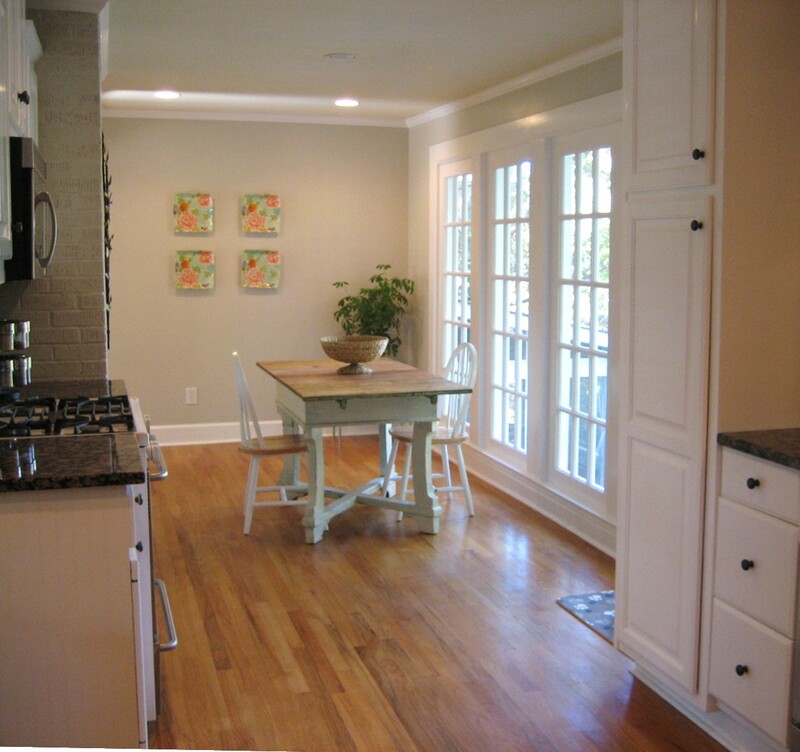 But, we have painted the buhgeezes out of every surface in the kitchen- cabinets, trim, windows, walls, etc. AFTER- Paint, paint, and more paint. 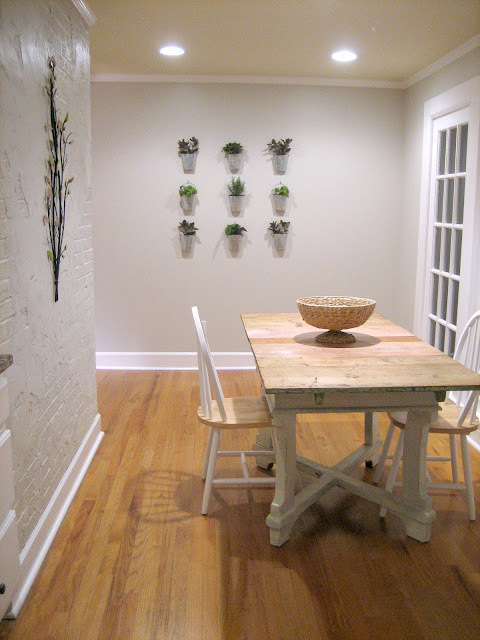 And, most recently, I added a garden wall in my breakfast room. AFTER- Alright, so I'm going to cheat and not post a current picture of the sunroom, as we can't even compete with the gorgeous leather chair and rug the previous owners had in this room. With only two of us in the house, we haven't had a need for this space yet. It is currently sitting empty but we'll get to it at some point! BEFORE- The master was used by the previous owners as a little boy's bedroom (complete with BB gun holes in the wall, lucky us!). AFTER- Check out the master bedroom renovation here and the more recent updates here. With some DIY art on the walls and some fresh paint, this room has become a nice little sanctuary for us! A pop of color with our spray-painted royal blue nightstands. 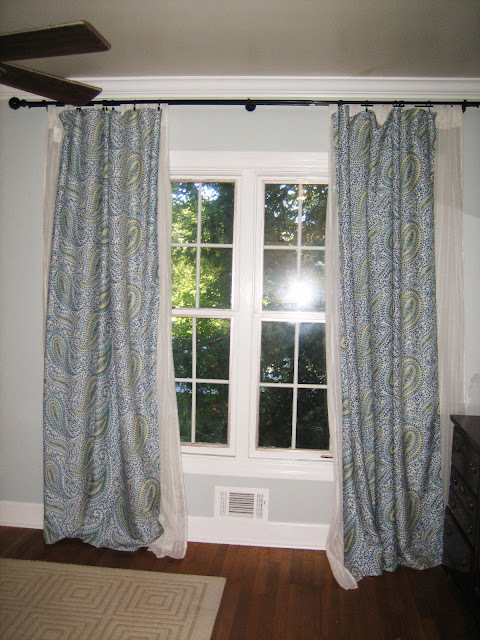 DIY curtains (see below for tutorial link). AFTER- We had to do something about all of the doors in that tiny space, so we opted for curtains in lieu of closet doors. 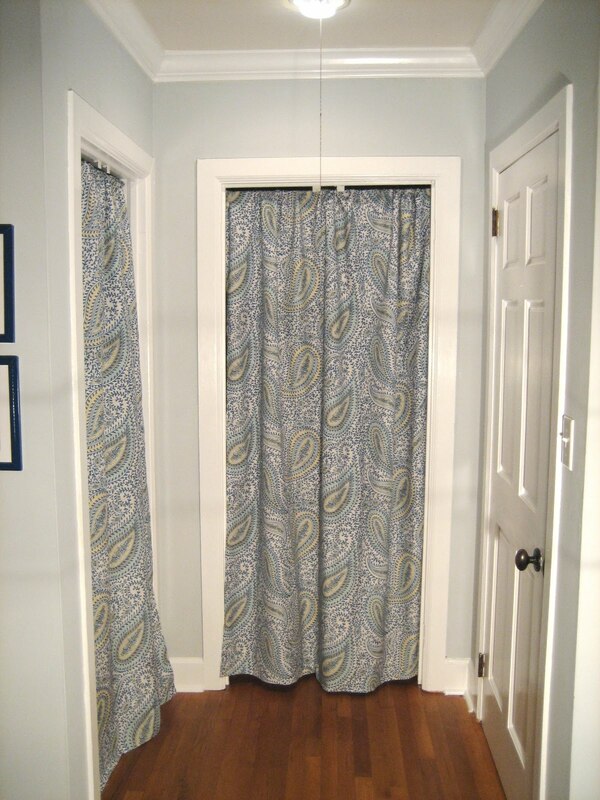 Check out the curtain tutorial here. We also made over the entire inside of the closet, so that it is more efficient and organized. 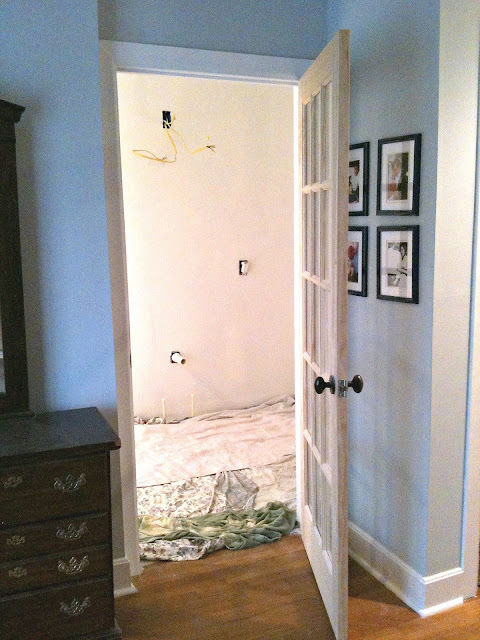 AFTER- We are almost done with our renovation of this room! Here is a summary of our work so far and here is our design board for the bathroom. This is what the room looks like as of today. BEFORE- Can you say pink?! 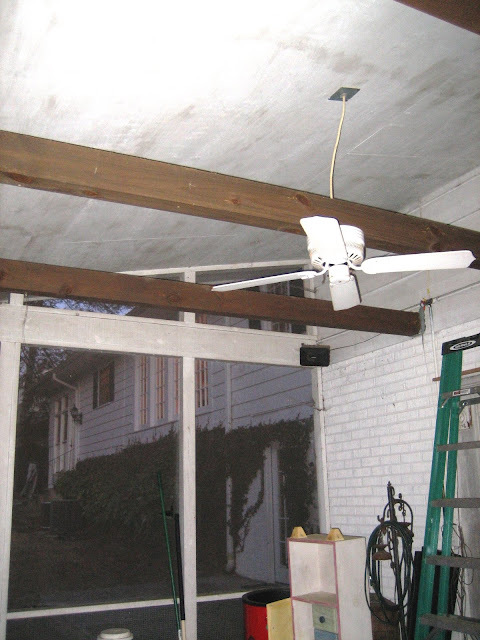 Check out the former owner's love of this Pepto Bismol color, including the ceiling! 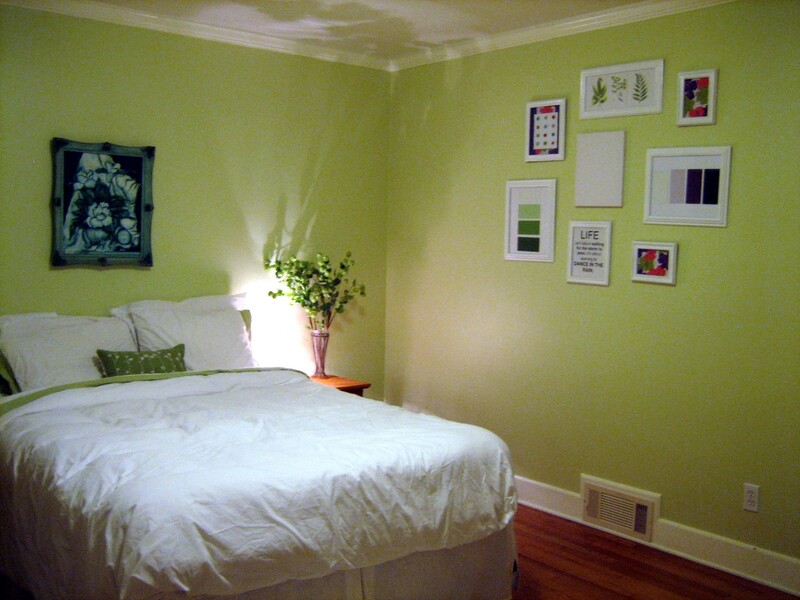 Check out the DIY wall art on our guest room wall. AFTER- Unfortunately, this room is currently sitting empty and we haven't done a thing with it yet. 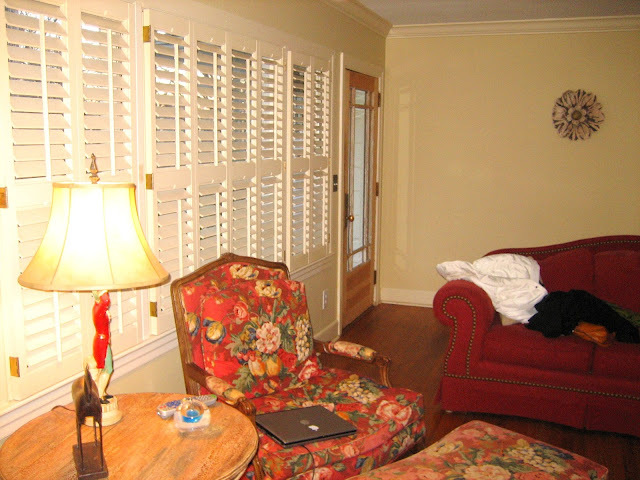 But check out the beadboard on the ceiling- love it! AFTER- We painted stripes galore! I recently created a gallery wall on one of our office walls. 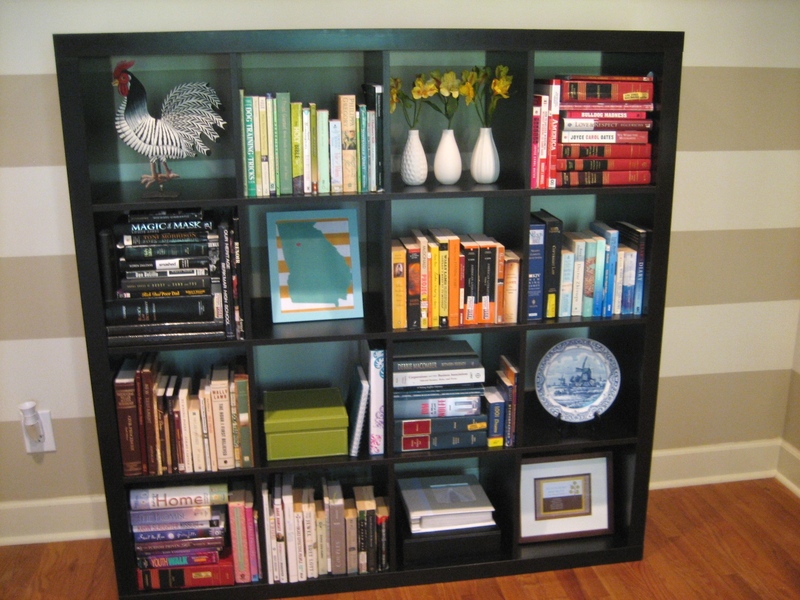 Like the rainbow colored bookshelf? AFTER- We had to pull up the carpet that was pretty icky, only to find 60 year old linoleum underneath. We haven't gotten to any renovations down here yet, but until then, it's a puppy haven! AFTER- We pressure washed and repainted the inside walls, replaced all of the old screening, and added a door to keep those pesky mosquitos out! AFTER- Staying true to my Charleston roots, we painted the porch ceiling "haint blue!" 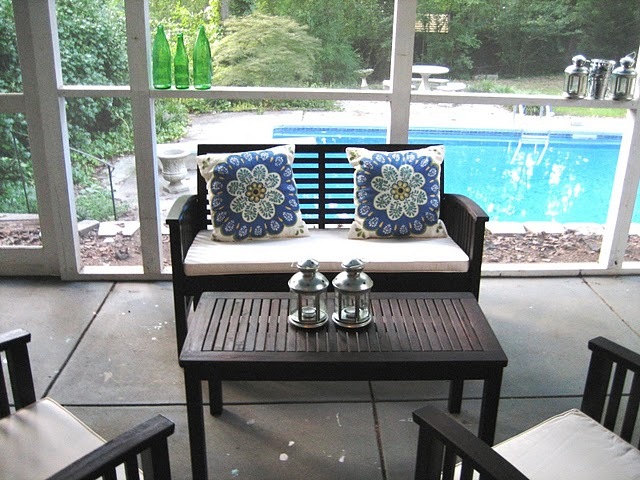 Check out the hunt for the porch furniture here. AFTER- We've also done a lot of work on the pool, including putting a new liner in. Lots of ideas and lots of potential back here, but our goal for now is just to get and keep everything cleaned up! AFTER- One of the biggest projects we (okay, okay, maybe not "we"... more like David!) have tackled was to pull up all of the ivy along the back of the swimming pool. 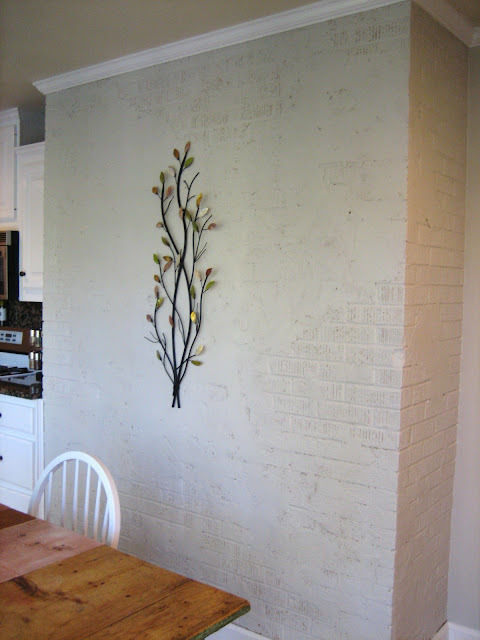 You can see, below, the awesome wall that David built in place of the ivy (and rotting railroad ties found underneath). Looks amazing! Hope you enjoyed the tour!! Looking back, I'm so proud : ) David and I have worked so hard to make this house our home and I think we've done a great job, if I do say so myself. Happy one year anniversary, little casa!! Hello! Your link is beside mine on BNOTP so I decided to visit. I enjoyed your before and after photos. Love all your rugs and the way you've freshened up everything. The pool looks so inviting! I know you can't wait to use it. I love the shutters and your bedroom curtains!! You guys have done a fantastic job!!! Keep up the good work!! I can't believe you guys got all this done in one YEAR! It's really amazing. I had seen most of the befores and afters through stalking your tabs earlier (what?) but it was fun to have them all in one place to go through again, and to have more of a timeline. 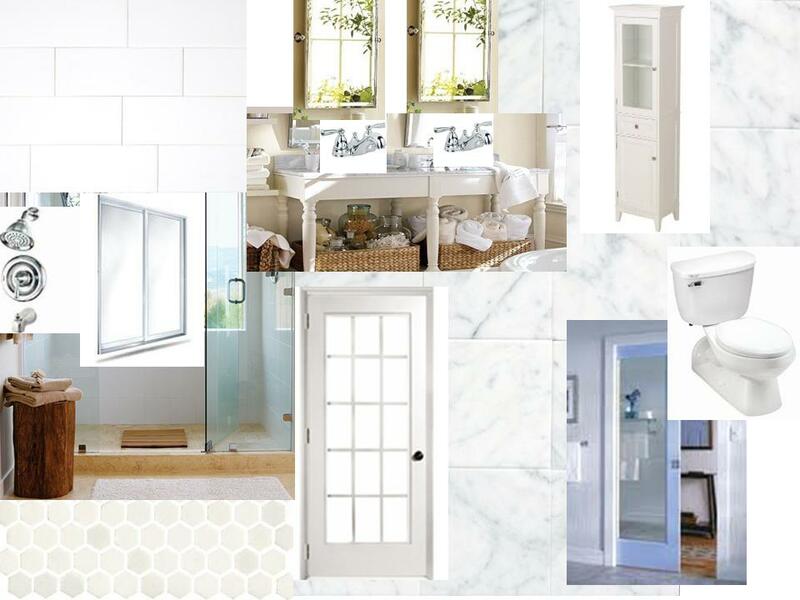 I am drooling over waiting for the bathroom redo grand reveal--where did you find the hexagonal tile for the shower floor (right?)? I think by far my favorite room is the office- kudos on those stripes. Oh, Michelle! So fun to see that journey. You guys have accomplished so much in such a short time. I just love the backyard shots. What time is the pool party. And how fun to have a great basement . . . something we are deprived of out west. Always love seeing your posts. WOW!!! You have done an amazing job. You should be so proud. The house is looking fantastic!! We are in the process, but practically had to gut the house (was our rental that tenants trashed) and it is coming along, but not as fast as yours has. Wow! So much work! Everything is beautiful. What an eye you have. Your house is just gorgeous! Love the ranch style...my absolute favorite! Thanks for giving us the tour! It's been so fun watching you evolve the house! Congrats on one year! you guys have done soooooo much work in a short amount of time. well done! The dining room of the previous owners is very gothic (could not imagine enjoying that space with the heavy chairs and light) Your dining room however- I could enjoy a nice drop of wine & with the added conveniance of the nearby wine rack I would be happy to stay a while. Great tour of all the wonderful changes you've done! Your house looks beautiful! The final work is awesome! Fantastic job! Congrats. Y'all have done some absolutely amazing things!! The house is just fantastic!! I loved looking at all of these pictures again! It always makes such a difference painting off white a nice crisp white it really makes everything pop! Great job! Question, are the appliances in the kitchen stainless steel panels or the stick ons? Happy anniversary! Gosh you have done such a great job. I can only imagine how much more beautiful it will be once you finish the reno's. Have a great week! Happy One Year Michelle. I am so impressed with all you accomplished in one year! 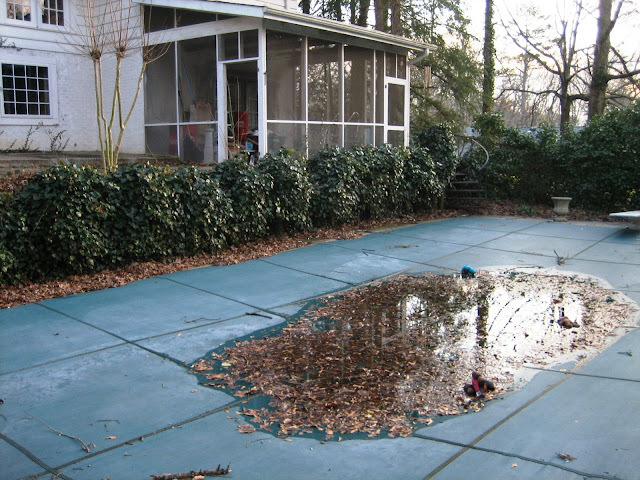 Your house looks amazing and I am totally jelly you have a swimming pool. I seriously love your home. It's so cute and filled with so much character. you guys have accomplished so much in a year- it's fabulous! Happy Anniversary to you and your adorable house! Y'all have done SO much in one year...I am impressed! 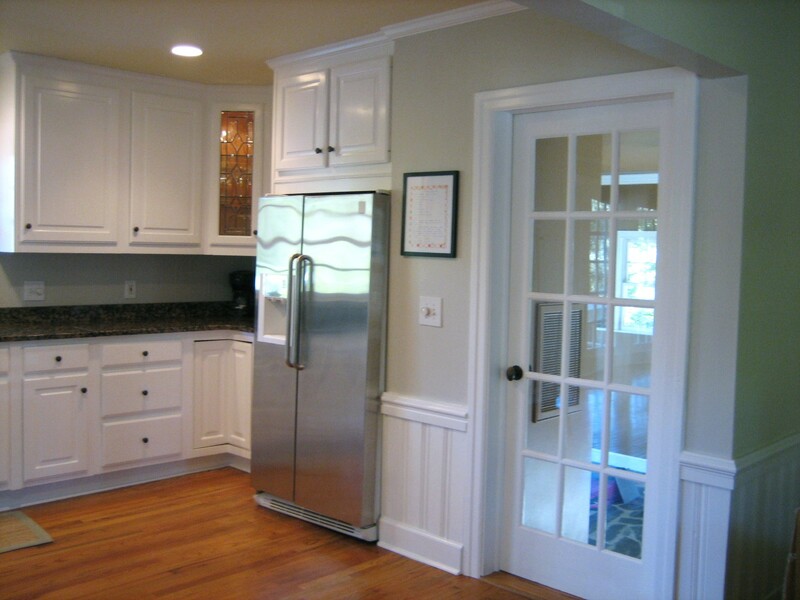 Did y'all paint your kitchen cabinets yourselves? I loved the tour and love your home! I can't wait till I have more rooms than we need. You have done such a great job renovating and decorating. Gorgeous! 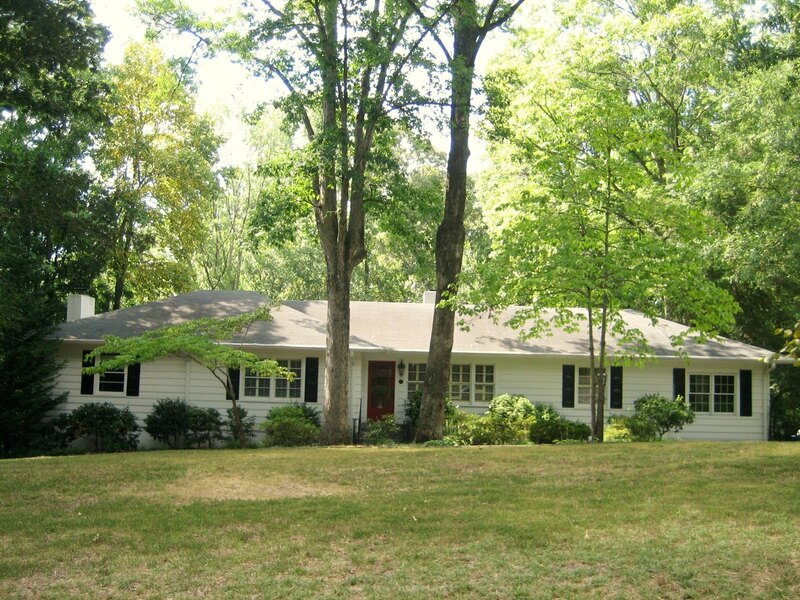 The home is SO much bigger than it looks from the front. In one year--yall have done SO much work and its beautiful! A year!! wow! can't believe it! You and David have done so much! YAll are amazing! Your home is gorgeous! 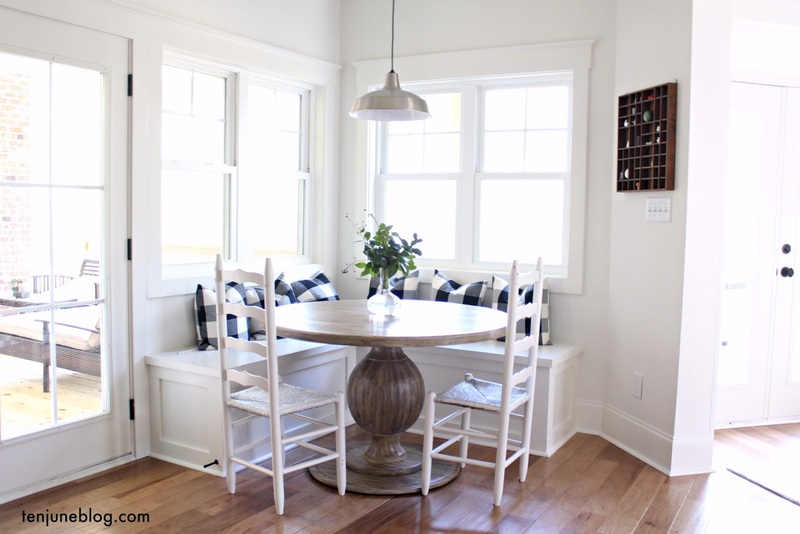 Love the vintage chair collection and the beadboard ceiling. Everything is pretty! I think you've gotten farther in one year than I have in 5 1/2!! How fun to see your before and afters! You've been busy and I love how you've updated your house and put your personality into it! 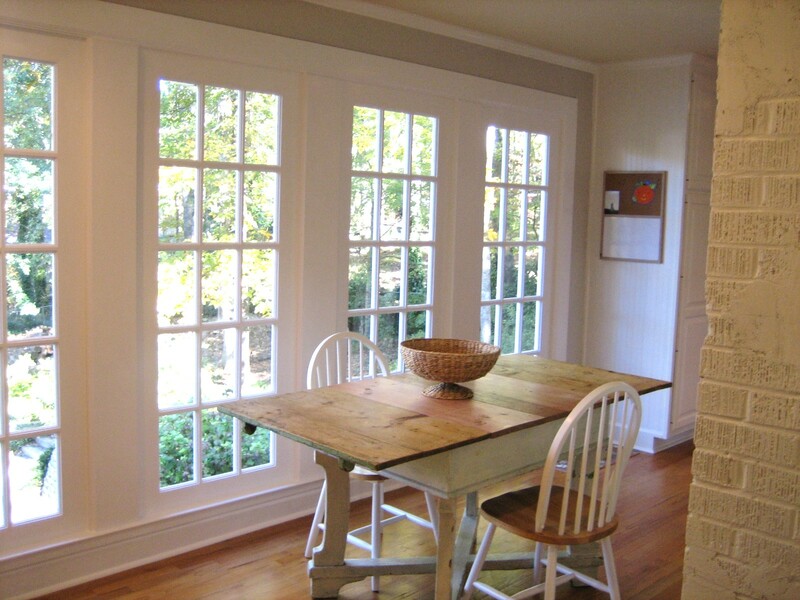 It's gorgeous and that sunroom is such a lovely space. That'll be a fun room to decorate someday! Fabulous work and makeover! What a lot of work you have done this past year! Gorgeous results! OMG... you have accomplished a LOT in a year!!! Crazy! Way to go! I can't believe you guys have done all that in only 1 year! Its beautiful Michelle! I love how light and airy it feels. 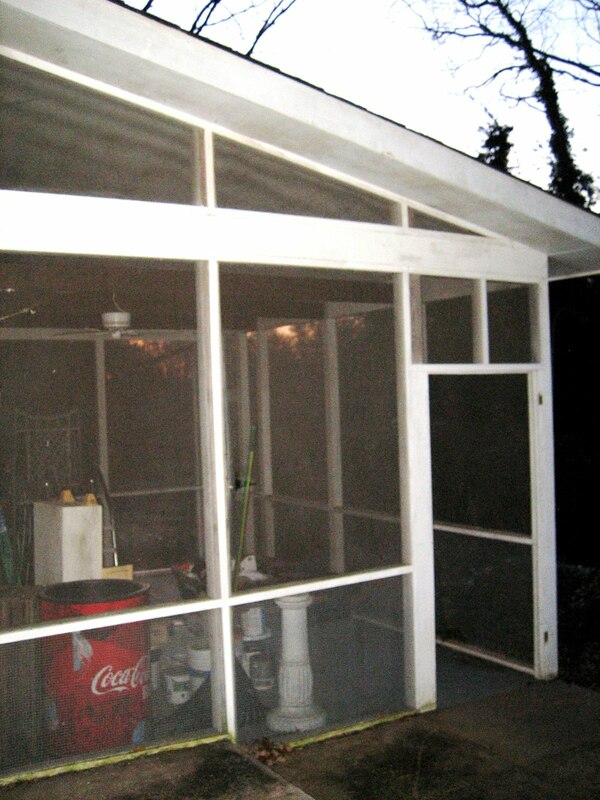 thanks for sharing the before and afters! Y'alls home is beautiful!!! Your home is just stunning! You have done such a beautiful job! I can't believe all you have accomplished in such a short time! Everything looks fantastic Michelle! I'm so impressed! Thanks for sharing! Wow...I cannot believe how much you guys have accomplished in a year! Great job. Your home is beautiful. What a lot of work, but so worth it. Absolutely beautiful. 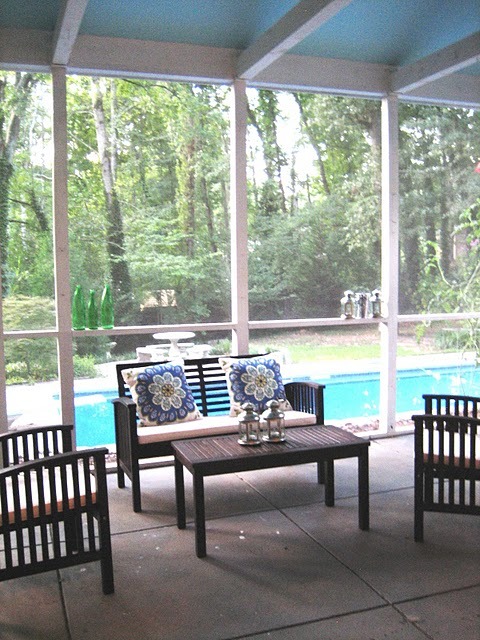 Your backyard is gorgeous...and I loved seeing new spaces in your home too! I think I just need to start from the beginning and catch up on some 10june!! So your house is amazing. And it's huge!! Love everything you've done with it! Pool party at Michelle's! I read every word and looked at each and every photo.....you all have done a magnificient job with your home! 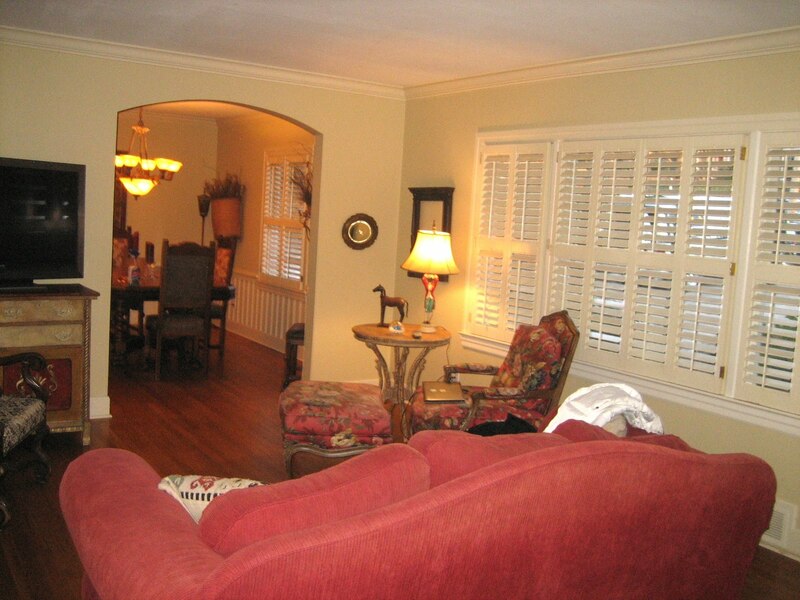 It is truly lovely and so inviting and homey feeling. I can see why you fell in love with the house! Our home was built in the late 1960's and we have lived here for the last 37 years. During that time, we have worked on it continously.....LOL....so I understand about making it "yours"......love it, and you all enjoy the fruits of your labor. Ohh my goodness. Every room is gorgeous! Thank you so much for the tour! 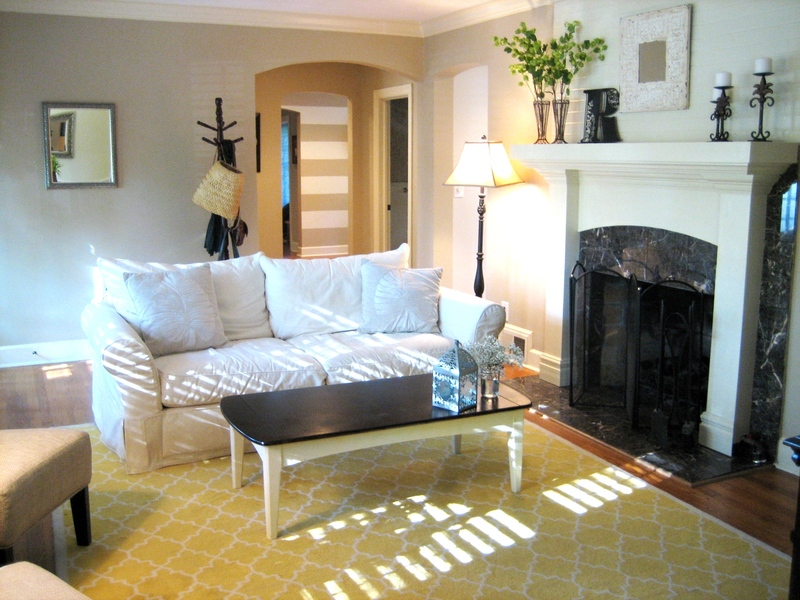 Its amazing how the right paint, decor, or rug can make such a big difference. I love your taste! Thanks for this post! It totally gave me hope for my casa! I'm celebrating 10 months and hope it will turn out as cute as yours! 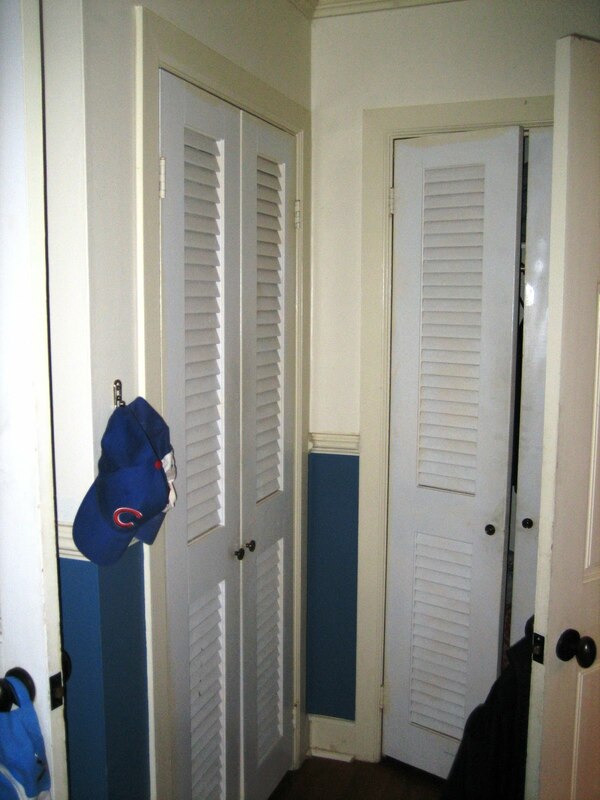 It is amazing how some of the simple projects will change the look so drastically- I painted my shutters and front door this weekend and BOOM! huge change!! LOVE your BLOG! You have done a FABULOUS job! I love people that people that can see when a house has "good bones." Some just need a little TLC! Wow you guys have accomplished so much this year! Where did you guys get your desk? Lovely job, you have completed a major transformation in a year. It is beautiful. Oh my gosh- y'all have been BUSY! You guys have made it into a HOME and a very welcoming, unique one! I love seeing your personality throughout. I'm seriously impressed! WOW! Your house looks just amazing! Love so many different aspects of it, you two really did a great job transforming this place into a real show place! I love it! You have done so much in one year! It looks amazing!! I really enjoyed looking at all your before and after pictures!!! Beautiful! You've come a long way! 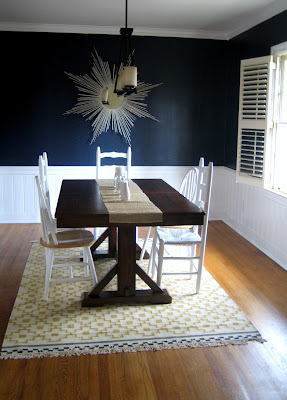 Love the brave dining room color choice & the striped office. Wow!! You have done a beautiful job on everything! ugh, I'm obsessed with your blue walls. And I'm so jealous you have a pool! Can I move in puh-lease?! Great job! love the garden wall! Looks gorgeous...love all of your tlc to each and every room! Congrats!! um, your house looks amazing. you know how you always forget how you came across someone's blog? well- seeing your pics reminds me of one of the first times i visited yours!!! Wow, your house is stunning both inside and out! I can't believe how much you've accomplished in just one year. Wow, so much hard work. I originally came over here for the garden wall but as a bonus i saw the striped wall in your office. 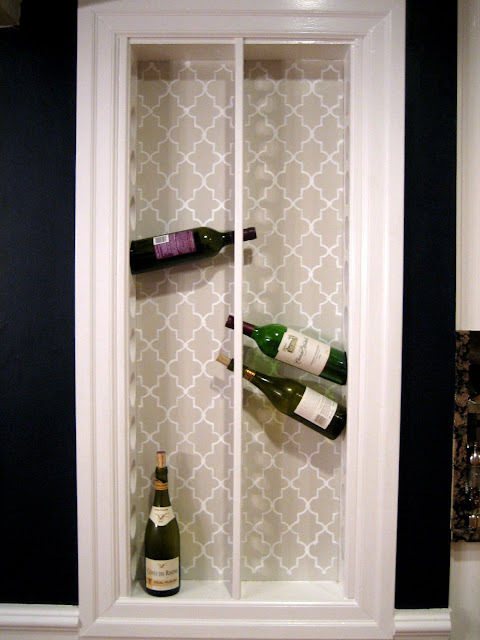 I want to do this in my craft room. I love it. I just can't decide what color. Maybe i will get the nerve soon. Thanks for the inspiration. The bones of the house were outstanding. I can see why you knew it was the one! Even under the pink bedroom you can see the beautiful windows. 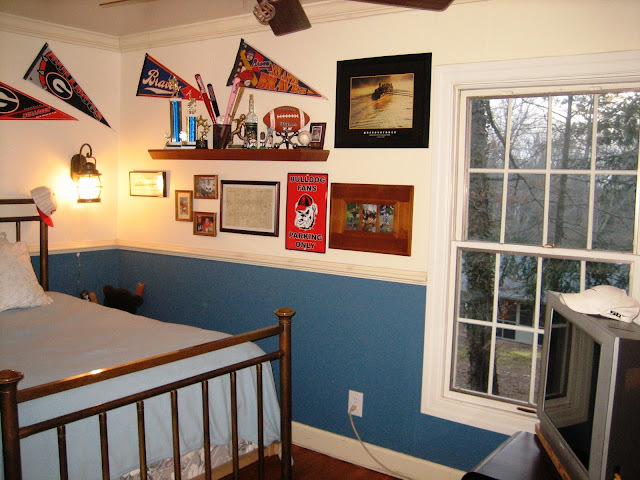 And all that wainscoting! You've done an amazing job of refreshing. 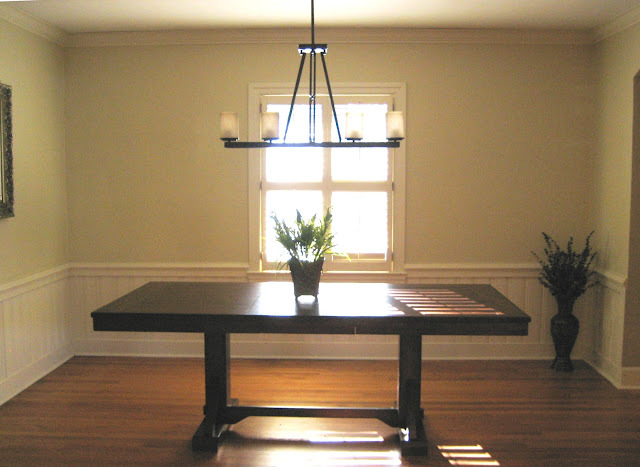 I would spend all my days in your breakfast room!